India is set to send back to China three Uyghurs who were jailed in 2013 for illegal entry and espionage, almost two years after they completed Indian court-ordered prison terms, documents show. The Ministry of Home Affairs (MHA) decided in May to deport Abdul Khaliq, Abdul Salam and Adil to China, although their petition seeking asylum in India was pending before a court in the state of Jammu and Kashmir, according to official documents accessed by BenarNews, an RFA-affiliated online news service. 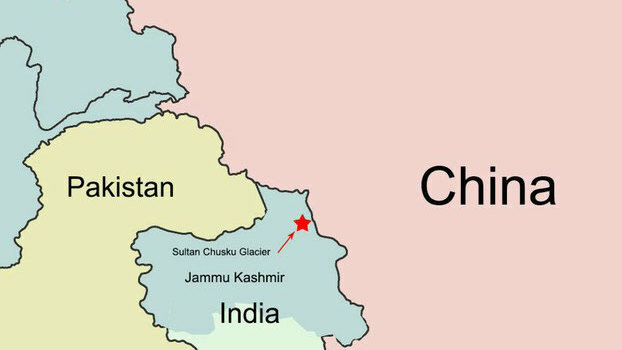 The three were arrested by the army near the Sultan Chusku Glacier in the Ladakh region of Kashmir, whose northeastern corner borders China’s Xinjiang Uyghur Autonomous Region, in June 2013. They were convicted of illegally entering India and espionage, and jailed for 18 months. But after completing their sentences in January 2015, they have remained locked up in a prison in Leh district under the controversial Public Safety Act (PSA). The act allows for detention without trial for up to two years. State officials said they only recently received directions from the ministry to arrange for the trio’s deportation. “The process of preparing travel documents for the three Uyghurs has begun and they will be sent back to China very soon,” Ravinder Raina, a senior leader of the Bharatiya Janata Party (BJP), which belongs to the ruling coalition in Kashmir, told BenarNews on Tuesday. “They had entered the Indian territory with an intention to spy and pass on information to security agencies in China. They are a threat to national security,” Raina said. On Nov. 11, the state government requested that the Jammu and Kashmir High Court dismiss the trio’s petition for asylum in India, he said. The three Uyghurs have consistently denied charges of spying for the Chinese government, and have maintained that they entered India to escape persecution in China. According to their petition for asylum submitted in court, they said they feared “being prosecuted or even executed” if sent back to their native country. The Uyghurs, a Muslim minority in China largely concentrated in Xinjiang, have been fleeing to other countries to escape Chinese repression. The authorities there consider them to be separatists and terrorists, and have cracked down on their religion and culture. The Turkic-speaking minority is also spread across Kazakhstan, Kyrgyzstan, Uzbekistan and Turkey. The petition states that the three will face charges for crossing into another country and there is a “high risk that the petitioners will be tortured upon their return to China.” In addition, they will face the prospect of life imprisonment or a death sentence, according to the petition. India’s MHA, however, had decided to deport Khaliq, Salam and Adil before the court heard the trio’s plea for refuge. In a letter dated May 17, the MHA wrote to the Jammu and Kashmir state government: “… it has been decided to deport/repatriate three Chinese nationals – Adil, Khaliq and Abdul Salam, R/O Xinjiang, China (Uyghur), presently lodged in district jail Leh – to their native country. Rights activists have come out in support of the three men, saying they should be given a fair hearing. “India should respect the international law that aims to safeguard the interests of refugees and give them the right to be heard. It should also extend them the right to access a counsel before taking an irretrievable decision,” V. Suresh of the People’s Union for Civil Liberties, a New Delhi-based human rights organization, told BenarNews. “China has no respect for issues faced by Uyghurs and there is a possibility of insecurity to their lives if they are deported. Nobody can say with [a] guarantee if they were spying for China, but India should respect the aspect of international law, which allows them certain protection,” he said. Ahsan Untoo, chairman of the International Forum for Justice and Human Rights, said Indian authorities had no valid reason to keep the Uyghurs in prison for two years after they had finished their sentences. “[T]hey are still languishing in prison under the PSA. And they are only being deported now because they can’t be kept in prison any longer. Authorities in Jammu and Kashmir are blatantly misusing the PSA,” Untoo told BenarNews. Uyghur activists echoed the criticism of India’s decision. “So far the ones who were deported back to China met with worse consequences. And the international community knows about it,” said Dilxat Raxit, a spokesman for the Munich-based World Uyghur Congress, a diaspora organization. “In this kind of situation if India deports these Uyghurs back to China, their consequence will be even worse,” he told RFA’s Uyghur Service. “They have to take this issue seriously. If these Uyghurs are deported back to China and get killed, how it does look in the world?” he told RFA. “Pakistan has deported a lot of Uyghurs, but we hope that India would not make this same kind of mistake. But they are about to do the same. If they are deported back to China, they too will be disappeared,” added Omer Uyghur.. But Indian state authorities defended the trio’s ongoing detention. “Any person who enters India with anti-national intention or commits an act that can be a threat to national security can lawfully be held for two years under the PSA. We will now complete all necessary formalities and deport them to China at the earliest,” Prasanna Ramaswamy, Leh district’s Deputy Commissioner, told BenarNews.